Civita Day Pack: Featured in Rick's TV series, our Civita (chee-VEE-tah: Italian for "little city") Day Pack is made of tough, ultra-light microfiber. It’s surprisingly roomy (11” x 14” x 5½”) with three zippered compartments; padded, adjustable backpack straps; heavy-duty zipper pulls; and two zippered side pockets for a water bottle, glasses or phone. Stuff a jacket inside and it’s soft enough to be a travel pillow! Color: Graphite. Civita Moneybelt: Made from the same ultra-soft microfiber fabric as our Civita Day Pack, our sturdy, ultra-light, under-the-pants moneybelt is your best guarantee against pickpocket theft when worn just under the beltline. It’s a passport and ticket-friendly size (11” x 4¾”) with two zippered pockets and three separate compartments. Use it to safeguard your passport, tickets, credit cards and cash! Europe Through the Back Door travel skills book: Packed with lessons gleaned from more than 30 years of budget travel, in this book Rick shares his knowledge, experiences, and discoveries to help you get the most out of your trip, including tips on money and budgeting, packing light, staying connected, health and hygiene, theft and scams, hurdling the language barrier, flying, getting around cities, and much more. Europe 101: History & Art for the Traveler book: This 420-page, fully illustrated rundown of Europe's history is written in a breezy, humorous style. 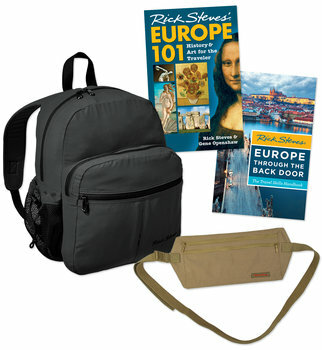 It includes 40 pages on art and music appreciation plus maps, timelines, and lists of Europe's must-see sights. Europe 101 gets you excited about art and history — not feeling like you just ate an encyclopedia. Earplugs: Just in case your roommate snores like a gorilla!